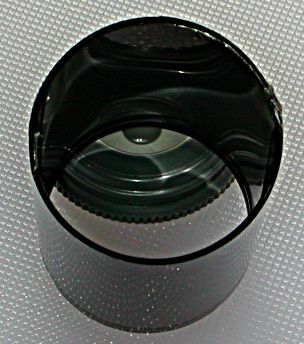 I’ve often wondered why the relatively tough little metal-clad 35mm roll comes in a neat plastic case, while the bigger and more delicate 120 roll has nothing more than foil to protect it. You can buy 120 film cans, but they are expensive after-market things. But best of all, I discovered that a Fuji can is a tight interference fit into an Ilford can. Since I knew that a 120 spool is a smaller diameter than a 35mm roll, and is less than twice the length, I knew I could do something with this. an Ilford film can. It doesn’t need to have a lid, as it will be acting as the base of the “stretch” 120 can. a Fuji film can. I’ve only used the black kind you get with the faster films. I suspect that the clear cans that are used on the rest of the range might work, but won’t be light-tight. a sharp knife. 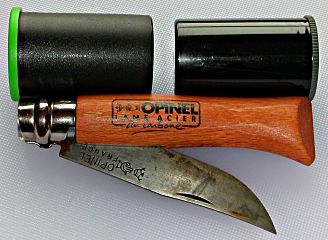 The pictured Opinel may not look much, but it has a razor-like carbon steel blade. Slice the end off the Fuji can. It helps to poke a hole in the side of the can a couple of millimetres up from the end, and then start slicing where you made the hole. Jam the now baseless Fuji can into the Ilford can, and push it down to the desire length. It really helps if you take the lid off the Fuji can, as otherwise you’d be working against air compression. It also helps if you have a spare 120 spool handy, to check that you haven’t pushed the two cans too far in to be useful. And there you are! It might be rather rough and ready, but it works. I don’t know how durable or waterproof these things are, but they’ll afford considerably more protection than having them rolling about loose in your camera bag. Sadly, and rather worryingly, I’m not the only person to think of this. I spent most of yesterday setting up the aquarium. It’s an 120l one, so it’s a lot bigger and heavier than anything I’ve worked with before. It’s been running since then, getting the water ready, and I put in a couple of plants today. Real plants, that is; not the plastic ones that came with the tank. The tank’s already got a couple of denizens; some tiny snails that were lurking on the plants. I don’t think they’re anything to freak out about yet. If they’re still alive in the morning, at least I know the water’s not completely toxic. The biggest problem has been making sure the heater’s working. Today it’s been hotter in the house than the tank, so I don’t know if the set-point’s wrong. Further to Matt Seaton’s article in the Guardian about atrocious cycle facilities, and highlighting Warrington Cycle Campaign’s Facility of the Month, can I just say that Pete Owens of WCC got the idea for the web page from my Crappy Lanes (archive.org copy) site? 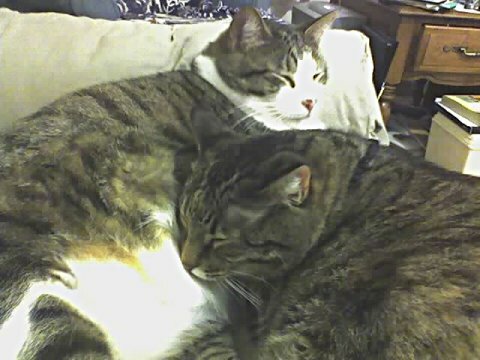 They are siblings, and very affectionate. Darn it, but my iRiver, with this recent firmware upgrade, now records a click about every minute it records. See the regular peaks? 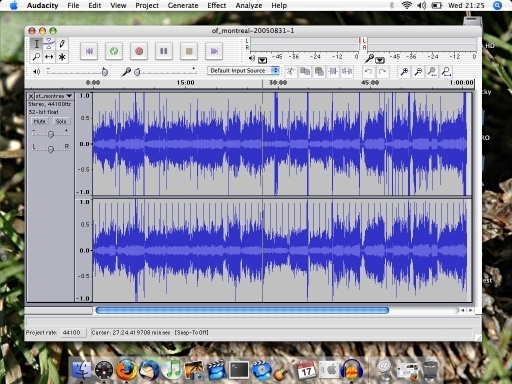 It hasn’t completely ruined my recording of Of Montreal, but it hasn’t helped.